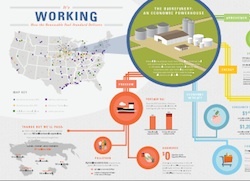 The American Coalition for Ethanol has once again put out an outstanding infographic, “Ethanol: An American Success Story,” demonstrating the benefits that renewable fuels bring to our country. The infographic uses creative illustrations, data and charts to explain how ethanol is reducing oil imports, becoming more efficient, creating jobs, saving consumers money and much more. This entry was posted in News and tagged ACE, American Coalition for Ethanol, ethanol, infographic.